SaX2 is a tool to configure the X11 system based on the XOrg version developed by freedesktop.org. The program comes with an easy to use Qt based GUI system to setup the most important features X provides. If called SaX2 will detect the graphics hardware including all graphics related peripherals and presents an automatic generated configuration suggestion. The user is now able to setup the system according to his needs using the GUI system. Warning: Since openSUSE 11.2 SaX2 is not used as default configuration tool in openSUSE anymore. Automatic configuration and dynamic reconfiguration mechanisms have been developed such that today the tasks that SaX2 was able to do are done fully automatically on the fly and can be modified from within a desktop session. 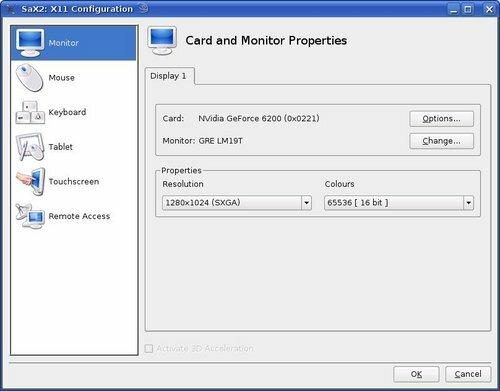 Change the Monitor, the Graphics Card and the Solutions. Setup proprietary drivers from ATI or Nvidia automatically if they are installed on your system. Warning: Be careful if you change the keyboard! Don't forget to test the new layout on the test line, before you accept the keyboard change. If you have selected an invalid keyboard layout, your keyboard can be nonfunctional after a restart and then you can't log in to your account(s)! This page was last modified on 6 January 2011, at 12:06. This page has been accessed 34,131 times.